TechCrunch reports Google has admitted its Project Tango tablet exists and will make it available to developers in late June for $1024. Project Tango is a 3D sensing system previously shown by Google in a smart phone using two cameras and rear depth sensor. The tablet carries these cameras as well as an NVIDIA Tegra K1 processor, 4GB of RAM, 128GB of storage, a 1080p display, stock Android 4.4, WiFi, Bluetooth LE and 4G LTE. If you’re interested you’ll need to sign up at google.com/atap/projecttango/ as the developer kits these tablets are a part of will be available in limited quantities. TechCrunch reports that the dating app Tinder is launching something called “Moments” allowing people who have been matched to share temporary messages including photos which only exist for 24 hours. Users can choose to like or dislike a photo and strike up a conversation based on it. What could possibly go wrong? ZDNet reports Microsoft is making its Kinect for Windows v2available for preorder today, June 5 for $199 through the Microsoft store. Sensors will be shipped around July 15 along with the release fo the accompanying SDK. Developers can build applications for the new sensor with C++, C#, or Visual Studio Basic by using Microsoft Visual Studio 2010. General availability of Kinect for Windows will come a few months later. Reuters reports Barnes and Noble will develop a tablet with Samsung to boost ebook sales. The tablets would feature Barnes and Noble’s Nook software. A 7-inch version of the Samsung Galaxy Tab 4 Nook is set for n early August launch in the US. Barnes and Noble will continue to offer its Nook GlowLight e-book reader. Our top story on the Subreddit was a Slashdot post submitted by Kylde, pointing to a Motherboard article that details all the ways fiber has been built in many places in the US and then blocked from use by telecoms to protect profit margins. The article covers a range of situations usually involving city governments granting contracts to companies like Comcast, Time Warner Cable, CenturyLink, and Verizon to build fiber networks in exchange for not allowing any other entities to use them. Which often means nobody but the city government gets to use them. daddn sent us the Forbes article that passes along info from 9to5Mac whose sources say Apple submitted specs to its licensing partners for headphones that use the lightning connector instead of the headphone jack. The advantage would be digital audio and more options for headphones to control apps. The downside would be if Apple used the ability to get rid of the headphone jack in future devices. Current devices would need a firmware update to enable the functionality if it ends up to be true. tekkyn00b sent us the TechCrunch story about an easter egg discovered in Google’s end-to-end encryption extension by Zen Albatross. A comment that reads “SSL added and removed here” followed by a winky. It’s a reference to the same phrase showing up in a leaked NSA document that illustrated how the NSA was able to spy on encrypted traffic from Google. habichuelcondulce submitted the Reuters story citing a person who says Sprint has agreed to acquire T-Mobile for around $32 billion. The deal is not final according to the source, as both sides have to do due diligence and arrange financing.Deutsche Telekom owns 67% of T-Mobile while Softbank owns the majority of Sprint. The deal would also require regulatory approval. AT&T sought to acquire T-Mobile three years ago but was blocked by the US Department of Justice. And bluntheadtrauma posted the ZDNet article about a fix to OpenSSL for a potential man in the middle attack. Unlike Heartbleed which affected any server, the attacker would need to control a network connection to exploit this vulnerability and non-OpenSSL clients (IE, Firefox, Chrome on Desktop and iOS, Safari etc) aren’t affected. All OpenSSL installations should be upgraded in any case. Jennie’s pick of the day is Mint.com This online budgeting service is simple and easy to set up/use. It reminds you about upcoming bills, warns you when you’ve gone over budget in a particular category, and provides suggestions on ways to save money. While it’s not meant to be full-fledged accounting software like Quicken, Mint is an excellent day-to-day reality check on just how much you’re spending. Free. Our top story on the subreddit was submitted by davidpolanco today. The New York Time reports Google released source code Tuesday for a Chrome extension called “End to End” that would provide OpenPGP encryption for messages within a browser. In other words, end to end encryption for Gmail users. Google wants developers to look for security vulnerabilities before the extension is released for wide use. Google will pay for any bugs found through its Vulnerability Reward program. Google already encrypts Web traffic to its Gmail product but that only works if the recipients provider also encrypts. Google released a report showing that 40-50 percent of email did not end up encrypted at the other end. Comcast was one of the worst with only 1% of its email ending up encrypted. Comcast told the Wall Street Journal its working on an encryption program for its customers that it hopes to roll out within weeks. Ars Technica reports that Microsoft has announced dozens of social and media apps will come to the XBox One as part of the next update. Among the apps announced for US users are HBO Go, Twitter, several cable TV network apps. All of these apps will be available without an Xbox Live paid account, as will existing apps like Netflix. Microsoft did not announce when the update will arrive but the company will have their E3 announcement in just 5 days. The BBC reports authorities in the Central African Republic have banned the use of SMS text messaging in the country as an emergency measure. Demonstrations have been taking place in the capital, Bangui, and a mass text campaign called for a general strike. Mobile phone users in CAR now get a message in French saying “SMS not allowed”. A government source told AFP the suspension might only last a few days. The Washington Post reports The US Secret Service posted a work order Monday for software that can detect sarcasm in social media. The order also wants the software to synthesize large sets of data and present it visually. And it must be compatible with IE8. So if you think you can identify influencers in real time on a heat map and detect when posts are being sarcastic, and root out false positives, just submit your proposal by tomorrow, June 9 at 5 PM. I’m sure that’s plenty of time. The Next Web reports LinkedIn revamped its premium accounts so paying members can choose a custom background, larger photo, and expanded header. Premium users also get keyword suggestions and receive emphasis in search. Paying members also get a full 90-day list of who viewed their profile and how they rank against first-degree connections. A new premium starter package including the new features will cost $10 a month. The waterproof Sony Smartband is finally coming to secondary markets like the US and UK for $99 and £80 respectively. The band counts steps and tracks sleep activity but also notes weather and vibrates for incoming text messages and phone calls. Sony released the band in Europe earlier this year for 99 Euros. You want new hardware? Intel’s trying to catch your eye at Computex. PC World reports Intel showed off the new Core M line of processors that draws less than 10 watts of power making possible a 7.2-mm thick tablet with 8 hours of battery life. The tablet is Intel’s “Llama Mountain” reference design, that manufacturers can you use as a jumping off point for their own tablets. Still a thin Windows 8.1 Pro tablet that has 8 hours of battery life and docks with a light keyboard to become a laptop looks appealing to some folks. Asus has already said they’ll ship Transformer Hybrids with the chip later this year. The Next Web reports on the rollout of Instagram version 6 to iOS and Android devices. Now when you select a filter on your photo you’ll see a wrench icon to give you access to a suite of editing tools. Among the new features are color adjustment, sharpen and the ability to adjust filter strength. Glass Almanac are among the folks reporting on Google’s announcement of Diane von Furstenberg-designed Google Glass. DVF|Made for Glass includes five new frames and eight new shades to convert you from GLASS-hole to GLASS-sionista! The collection will be available June 23 for Glass Explorers. Kickstarter has gone anarchist and ended all rules! Well not quite. GigaOM tempers things with facts, but DOES report that the new rules make it more attractive for hardware makers who had been turning to Indiegogo and the like and their less restrictive policies. One major change is a new feature called “Launch Now” for qualifying projects to skip the wait for a community manager’s approval. About 60% of projects qualify right now and Kickstarter expects that to rise. The new simplified rules simply state the project must create something to be shared, be honest, and not raise money for charity, offer financial incentives or involve prohibited items. The Next Web reports Motorola announced Moto Stream, an accessory that can make any speaker a wireless Bluetooth speaker. Up to five connected devices can drop tracks into the speaker as long as they’re within 300 feet. It’s available today for $50 at Motorola.com. Reuters reports Facebook acquired Finnish company Pryte which provides a service allowing phone users without data plans to purchase data in small quantities meant to gain access to specific apps like Facebook itself. Mashable reports Turkey’s telecommunications authority lifted a ban on YouTube Tuesday four days after the Constitutional Court ruled that the ban violated Turks’ free speech rights. YouTube was blocked for a total of 67 days. GigaOm reports on the launch of a robotics research partnership between the European Commission and 180 private companies, called SPARC which will invest €2.8 billion. The European Commission believes SPARC will lead to the creation of over 240,000 European jobs and hopefully a lot of really friendly European robots. Mary Jo Foley at ZDNet reports that her sources say Microsoft’s Tiled Interface version of Microsoft Office, meant for tablets, won’t arrive until Spring 2015 now, meaning Office for Android will arrive first, sometime before the end of 2014. KAPT_Kipper sent in the CNET story about how John Oliver brought down the FCC. Sort of. Oliver spent 13 minutes on his show “Last Week Tonight” delivering an insightful description of Net Neutrality, capping it off by calling for all the trollish commenters of the Internet to “focus your indiscriminate rage in a useful direction” at fcc.gov/comments . Yesterday the FCC’s comment system buckled yesterday afternoon under the pressure of that rage suddenly being focused on one point. It seems to have recovered— for now. metalfreak posted the Ars Technica article about the release of a 64-bit version of Chrome announced on the Chromium blog. Google claims the new version brings 25% performance improvement in graphics and multimedia. Google also claims improvement in security and stability. 64-bit Chrome is currently available for Windows 7 and Windows 8.1 in the developer and canary channels. And Splendor78 pointed out the Washington Post article about Suzi Levine becoming the first US Ambassador to take the oath over a Kindle e-reader displaying the US Constitution. This continues a trend. New Jersey firefighters were sworn in on an iPad edition of the Bible in February. Discussion Section Links: Hardware Delight! Audible is my pick of the day. I started with a book called The Moon is a Harsh Mistress a few years ago when I heard it mentioned on a podcast by Tom. I have discovered a ton of great content including the Dresden Files series and several biographies that are made so much better when read by the author. My library now includes hundreds of books and with the cost per book being less than $10 when you do the highest tier membership it’s a great deal. Thanks Tom for introducing me to Audible, it has made the daily commute, workouts at the gym, and walking the dogs daily much more enjoyable. That new hardware we’ve been waiting for has finally been announced by the world’s leading smartphone maker at its developer conference! Samsung launched the world’s first smartphone powered by the Tizen operating system!! The Samsung Z. Samsung also uses Tizen in its Galaxy Gear 2 smatwatch and released a developers kit for Tizen-based TVs. The Z goes on sale in Russia sometime between July and September. The BBC reports The United States has charged a Russian man named Evgeniy Bogachev of being involved in a cybercrime attack affecting more than 1 million computers. Authorities have seized control of a botnet used to steal personal and financial data, though they believe its operators may regain control in about two weeks. Bogachev is said to go under the names lucky12345 and slavik, and is thought to have last resided in Anapa, Russia. Charges filed in a court in Pittsburgh include conspiracy, wire, bank and computer fraud, and money laundering. Apple announced new features for its main operating systems, OS X and iOS, at its Worldwide Developers Conference in San Francisco. The next version of OS X will be called Yosemite and include a new design similar to iOS7 plus several new features including adding online search to spotlight, airdop compatibility with iOS devices and the ability to answer phone calls and send and receive non-iOS text messages from the desktop. iOS8 will get many new features including support for replacement keyboards, platforms for health info called HealthKit, and home automation called HomeKit and a new programming language called Swift. Siri gets shazam integration as well as an always on mode that can be activated by saying, “Hey Siri.” And iCloud Drive now is integrated into finder, works across devices, and gets a price cut to 99 cents a month for 20 GB and $4 a month for 200 GB. OS X Yosemite is available to developers at WWDC today, will go into open beta in the summer and come to all for free in the Fall. iOS8 is available to developers at WWDC today and will come to all in the fall. You Start Menu fans may have to wait a bit longer for its triumphant return. ZDNet’s Mary Jo Foley says a change in plans may delay the menu from returning in Windows 8.1 Update 2, expected to arrive in August. Looks liek the Menu will wait until the release of Threshold expected in April 2015. Microsoft’s Terry Myerson showed off the new start menu at the Build conference in April, but did not promise when it would arrive. tm204 posted the 9to5Google story that Asus announced a slate of new Android tablets at Computex including a lineup for the MeMO Pad Series, a next-gen FonePad and a tablet/laptop/smartphone hybrid Transformer Book V that runs Windows and Android. That last one has 12.5-inch display with a up to a TB of storage. Asus says it’s, “the world’s first five-mode, three-in-one covered laptop that features a Windows and Android laptop and tablet as well as an Android smartphone.” No price or release dates on nay of the new products. KAPT_Kipper sent in the GigaOm story indicating that sources told the Wall Street Journal and Space News that Google intends to spend around $1 billion to launch 180 small satellites into space in order to provide global Internet service. Greg Wyler of O3b networks has apparently joined Google and started a company called L5 or WorldVu. That company supposedly has access to the Ku-band spectrum abandoned by SkyBridge. What the service would be and how much it would cost is unknown. metalfreak noted the GreatFire.org version of a story also reported by Reuters that Google services are being disrupted in China. GreatFire reports the blocks started four days ago and now extend to all Google services. Greatfire also suggests IP addresses that can be used to evade the block. This week marks the 25th anniversary of events in Beijing’s Tiananmen Square. Plug of the day: Today’s plug is for a terrific weekly podcast called 8-Bit Life, in which host Roberto Villegas talks in depth with an eclectic mix of guests from the online universe. This week Roberto’s guest is someone you may have heard me mention on this show once or twice; our own producer Jennie Josephson, who has something to say about how this whole show got its start. Engadget reports more details on the unannounced Samsung virtual reality headset. Engadget’s sources now say the headset is a collaboration between Samsung and Oculus VR. Oculus handles the software giving Samsung early access to the mobile dev kit while Samsung does the hardware and gives Oculus early access to next-gen OLED screens. As ordered by the EU, Google has implemented a solution for removing URLs from its index for Europeans that wish to be forgotten, as is their right. Just attach a copy of a valid photo ID, name, email, country whose law applies, and a list of every URL to be removed. Then explain why the link is “inadequate, irrelevant or no longer relevant, excessive in relation to the purpose,” and you’re soon forgotten! Ars Technica reports Google will close its Fort Worth, TX factory which makes Moto X smartphones. Mark Randall, Motorola’s senior vice president for supply chain and operations, told the Wall Street Journal that poor sales of the Moto X prevented the company from achieving economies of scale and also blamed labor and shipping costs. Motorola is in the process of being sold to Lenovo by Google. That deal should close later this year. Steve Gibson continues to follow the TrueCrypt story at GRC.com and has a page collecting all the developments as they happen. Among the significant events, the Open Crypto Audit Project will proceed with phase II of its security audit of the whole-disk encryption software, despite the developers abandoning the project. Phase II will analyze the entire way encryption is implemented in TrueCrypt. Also Steven Barnhart posted on Twitter that he received emails from a TrueCrypt developer indicating there is no longer interest from the developers, there was not government pressure, and feels a fork of the code would be harmful. Those emails have been submitted to Ars Technica for vetting. The Next Web reports WeChat has added an option to the Chinese version of its app, allowing verified official accounts to set up e-commerce stores in the app. WeChat’s Chinese app, is expected to rake in $1.1 billion in revenue this year on in-game purchases, flash sales and other transactions it operates itself. WeChat owner TenCent would like to create a place where users can talk, play games and shop without leaving the app. It looks like your writing an 2 billion dollar offer sheet to buy an NBA franchise, would you like help? Former Microsoft CEO Steve Ballmer mercifully ended a nine month hiatus as a public figure, resurfacing to buy the Los Angeles Clippers from Shelly Sterling, wife of embattled racist Donald Sterling. The sale is pending a Tuesday vote by NBA owners, who have plenty of reason to “get on their feet” with excitement, the 2 billion dollar tag represents the most an NBA team has ever sold for. Despite previous attempts to move a franchise to Seattle, Ballmer has indicated he plans to keep Blake Griffin setting blue screens of death for Chris Paul in LA. Hat tip to Kylde who submitted this one on the subreddit. BloombergBusinessWeek reports that Laszlo Block, Google’s SVP for people operations posted to Google’s blog about the company’s diversity statistics. 30 percent of Google workers are women and 39 percent are racial or ethnic minorities. The majority of nonwhite Google employees are of Asian descent. This puts Google close to the middle among tech companies that disclose these sorts of statistics. More companies are feeling pressure to reveal diversity statistics. Facebook COO Sheryl Sandberg has said that Facebook plans to reveal theirs eventually. GigaOm reports on YouTube expanding its video quality report to include regions in the United States. The report, previously released in Canada, gives stats on the streaming quality of YouTube on your ISP and compares it to other ISPs in your region. The Verge has a story on a report from security consulting group iSight Partners that claims a phony news agency called NewsOnAir has been building ties with senior US military and diplomatic officials as well as US and Israeli defense contractors. The group would make social network connections and use fake names over services like Twitter, Facebook, WordPress and LinkedIn. The aim of the site was to present fake login pages to steal credentials. The group’s central domain was registered in Tehran. BBC reports Turkey’s Constitutional Court has ruled a block on YouTube violated freedom of expression laws and have ordered ISPs in Turkey to lift the block. Lower courts have previously ordered the block lifted but the government did not respond, claiming offending material still existed on YouTube. BBC also reports London’s transport authority has announced it does not believe Uber’s car service breaks laws by using an app to determine charges.The authority referred the matter to the High Court to issue a binding ruling on the matter. The Taxi Drivers claim the app is equivalent to a meter which private drivers are not allowed to use. The drivers plan a demonstration for June 11. Our top story on the SubReddit today was submitted by Nova461. Developers of TrueCrypt are redirecting traffic from their website to a sourceforge page claiming the software may have security vulnerabilities and due to the end of support for Windows XP, they will no longer develop TrueCrypt. The developers posted instructions for using alternative disk encryption on Windows and OSX. Kylde submitted the Ars Technica story that a group at Brigham Young University has created an app for Google Glass to help the deaf to view an ASL interpreter in dark situations, like a planetarium, without bothering other attendees. The project is called Signglasses. The full results of the group’s research will be published in June at the Interaction Design and Children conference. KAPT_Kipper passed along the Ars story about researchers at Japanese Telecom NTT publishing a paper that includes a description of a working 115-bit optical Random Access Memory device made of photonic crystals. The crystals can store light in a high-energy state and emit it after a high-energy pulse, thus optical bits. Granted they’ve only achieved 105 optical bits so far. That can be increqased, the bad news is the energy usage. 28-bit memory takes about 150 micro-watts to store which will be hell on your battery life. But if that can be figured out fiber optic singals wouldn’t have to be converted to electronic ones to be useful. Fiber to your RAM! And SkyJedi & HarryLeeSmith let us know that Ars Technica reports that the Linux Foundations’ Core Infrastructure Initiative, which was formed in response to Heartbleed, has raised enough to fund a security audit of OpenSSL’s code base as well salaries for two full-time developers. OpenSSH and Network Time Protocol will also receive support for developers and infrastructure. The killer feature for me is password completion in android apps, including Chrome for website logins. I recently got a Nexus 7 and setting it up with all my apps took no time at all because I first installed the LastPass app which filled in all my logins as I went. The mobile app used to have its own browser so I had to choose between password completion or the functionality of Chrome – but now I can have both. It’s only on Android for now it seems and it works by pretending to be an accessibility aid – popping up on screen when a prompt is detected which works well about 95% of the time. Friday’s Guests: Molly Wood and Justin Robert Young! CNET reports from the Code Conference by Recode that Sergey Brin of Google unveiled a prototype two-seater driverless car without a steering wheel. The cars built-in sensors and software are the only control system. The project has only been tested at low speeds of 25 mph or less but has experienced no crashes. Recode reports Microsoft’s VP of Skype Gurdeep Singh Pall demonstrated Skype Translate on stage at the Code conference yesterday afternoon. The feature uses speech recognition, text to speech and machine translation to offer real-time translation on a live Skype call. Pall demonstrated it translating from English to German and back in a conversation with a German employee. Pall said the feature should launch in beta later this year with a limited number of languages for the Windows version of Skype. ZDNet reports Apple has acknowledged the attack, largely targeting Australian users, that has locked some people out of their iOS devices. Apple noted “Cloud was not compromised during this incident. Impacted users should change their Apple ID password as soon as possible.” Users from Australia, New Zealand, Canada, and the US report being hit by the attack. Oh you thought we were done with news about people talking at the Code Conference? Not quite. Intel CEO Brian Krzanich wore a smart shirt during his talk. The shirt measured heart rate and other vital signs and was made in conjunction with AiQ. The battery-powered shirt shold be available this summer. Krzanich also showed off Jimmy, a white robot that can walk, talk and dance. Intel has plans for a cosnumer robot-making kit that could sell for $1600. Krzanich admitted Intel missed the tablet trend, and while they haven’t given up on tablets they’re focused on not missing the next big market. Mashable passes along that the WSJ reports Facebook asked the European Commission to review its acquisition of WhatsApp in order to prevent future legal challenges in European countries. Facebook was not required to get European approval, but may have decided it was just easier than fighting country by country later. GigaOm reports Samsung announced plans to create an open platform for developing sensors and services to track personal health in real time. The initiative will start with a modular wristband reference design called Simband that tracks heart rate and blood pressure, but could expand into other devices. Samsung also announced a $50 million digital health challenge to encourage development of better sensors and algorithms for health care. Oddly Samsung didn’t cover federal approvals and told GigaOm it is not seeking FDA approval. TechCrunch reports on a new $199 3-D printer called the MOD-t designed by Frog Design and backed by Idealab. The low entry level price gets you a minimum layer height of .02 mm and the ability to print using the starch-based plastic, PLA. The printer is small and the printing plate moves under the stationary head reducing some complexity though printing slowly. Backers of the Indiegogo for the printer can get the model even cheaper for $149. Looks Like Mark Zuckerberg can skip a court date. BuzzFeed passes along that the Iranian Student’s News Agency has removed the story from yesterday stating a court in Fars had required Facebook’s Director or his attorney to appear in court. ISNA has published a statement by the Fars province prosecutor’s office denying the report. Al Monitor reports the chief prosecutor of Shiraz also told the official Islamic Republic News Agency that the reports were false. Our top story on the subreddit was submitted by KAPT_Kipper. Valve announced it will not be releasing its own version of the Steam Machine and Steam controller until 2015. Valve’s Eric Hope said the company got a “ton of useful feedback” on the controller and want to get it right. The delay will not impact the release of SteamOS and has no affect on third-party steam machines not made by Valve. MikePKennedy submitted the Verge article that Amazon has confirmed it is buying less inventory from Hachette Publisher and no longer taking preorders for Hachette books as part of a dispute over ebook prices. Amazon even suggested customers might want to consider Amazon competitors for buying Hachette books. Amazon also suggested that it and Hachette create a pool of funds to disburse to Hachette authors who are being affected by the slowdown in Hachette sales. Hachette declined the offer at least until after Amazon and Hachette come to an agreement. I have been using Bossjock Studio for IOS for about a year now. It is a really nice podcasting app that allows you to mix in music and such as well as export files as mp3 or AACs to various platforms. You can email the files, transfer them to your computer and ftp them to many places. It is a great mobile podcasting platform and I use it a lot with my son for his podcast, the Jonathan Files. Shannon Morse is on the show to talk about the new LG G3 and Apple and Google’s assault on the smart home space. LG announced its new G3 smartphone so no more leaks, just facts. The Android 4.4.2 Kit Kat phone has a 5.5-inch 2560×1440 display with 538 ppi. The 13.1 mpxl rear camera features laser autofocus and optical image stabilization. LG really pitched simplification with features like squeeze to take selfie, an adaptive keyboard that improves accuracy over time, and knock to unlock which uses a pattern of taps as your unlock code. Inside is a Snapdragon 801 2.5GHz Quadcore, 2 or 3 GB of RAM and 16 or 32 GB storage. LG will start selling the G3 in South Korea Wednesday with additional regions to follow. Pricing varies by market. The Verge notes The Information reports its sources say Google’s Nest Division has considered acquiring Dropcam as part of a larger decision to move into Home Automation. Nest makes a Thermostat and a smoke alarm called Protect. Dropcam makes a connected camera with a cloud DVR service and smart sensors that can detect things like open doors. This follows on the report yesterday from The Financial Times that Apple may announce its own smart home platform at WWDC next week. Bloomberg BusinessWeek reports Intel signed an agreement with China’s FGuzhou Rockchip Electronics Co. to jointly offer a quad-core processor and integrated modem called Sofia in the first half of 2015. Rockchip will market the processor to Chinese customers. Taiwan Semiconductor Manufacturing Co. will make the chip until the end of 2015 when it will shift into Intel plants. Getting a seller of chips based on ARM to make Intel mobile chips is an important step in Intel’s plan to get more competitive in the mobile chip space. The Sydney Morning Herald reports that an attacker in Australia has used the Find My iPhone feature to lock users out of their own iPhones, iPads and Macs. Those with lock codes could regain access. Others received requests for payments of 50 to 100 dollars in order to regain access to their devices. CNET reports the China Academy of Cyberspace issued a new report called “America’s Global Surveillance Record” accusing the US of targeting Chinese leaders, Chinese companies, scientific research institutes, and ordinary citizens with cybersurveillance. In addition Bloomberg reports Government agencies in China are asking banks to replace IBM servers with machines from local companies as part of a test program. Reuters reports a court in the southern Iranian province of Fars has opened a case against Facebook-owned Whats App and Instagram after receiving complaints of privacy violations. The court ordered the director of Facebook or his official attorney to defend himself in court and pay for possible losses. Engadget reports Hector Xavier Monsegur aka Sabu of LulzSec has been sentenced to time served by a US Federal Court, letting him walk free. Prosectors said Monsegur was a very “productive cooperator” providing information that helped the FBI take down LulzSec and stop a string of cyberattacks. Ars Technica reports the US FCC chief of staff Ruth Milkman spoke today at a Progressive Policy Institute event titled “Should the FCC Serve as Internet Traffic Cop?”. Milkman said the agency does not know the answer to whether peering, transit, and other interconnection issues need further regulation or can be handled in the marketplace. The FCC is seeking comment on whether the scope of its current net neutrality rulemaking discussions should include these issues. Our top story on the subreddit came from metalfreak who posted the IT World story that a bug in an e-voting application halted the release of European federal and regional election results in Belgium. Some older voting machines got different results for preferential votes depending on the way they counted them. That should not happen. A fix to the problem was developed halfway through the night and voting resumed. The machines in question are PCs with two serial ports, a parallel port, 1 megabyte of RAM and a 3.5-inch disk drive used to load the voting software from a bootable DOS disk. spsheridan submitted the Ars Technica story by Cyrus Farivar about his experience requesting his travel records from the US Customs And Border Protection agency under a Freedom of Information Act request. He received 72 pages of information, much of it redacted to protect the subject’s privacy, even though he was both the requester and the subject. Most of the records showed when he had left or re-enetered the country as well as whether he was subject to inspection. One entry noted him as a journalist. Farivar had been interested in receiving a Passenger Name Record which often times record IP addresses used to book travel. He did not receive that record although he asked for it directly in his original request. In 1844 – Samuel Morse sent the message “What hath God wrought” from the Old Supreme Court Chamber in the United States Capitol to the Mount Clair train depot in Baltimore, Maryland. It was the first public demonstration of the telegraph. In 1935 – General Electric Co. sold the first spectrophotometer. It could detect two million different shades of color and make a permanent record chart of the results. In 1961 – Wes Clark began working on the Laboratory Instrument Computer (LINC), at MIT’s Lincoln Laboratory. It was one of the earliest examples of a user-friendly machine that you could communicate with while it operated. It’s credited with setting the standard for personal computer design. Subscribe to the podcast. Like Tech History? 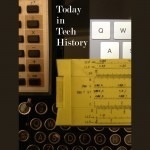 Get Tom Merritt’s Chronology of Tech History at Merritt’s Books site.